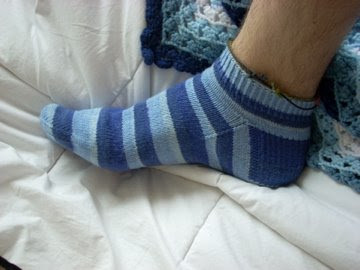 To start out, I finally finished those Blue-Stripey Socks that I am in love with, and I am still in love with them! I think I got a bit too excited to finish the second one and may have started the toe a few rows before I should have, so it is a bit snug, but that's no problem. I also had no intention of trying to line up the stripes. Yarn: 1 and 1/2 skeins of Knitpicks Felici sock yarn in "Atmosphere"
I loved knitting these socks. I thought I would be extremely bored knitting socks in plain stockinette, but I was always excited for the next color change and I actually enjoyed that I could bring them anywhere and kind of zone out while I was knitting because there was no pattern. For the cuff I knit 15 rows in a twisted rib (k1tbl, p1) and then I knit ten rows in plain stockinette before I started the heel flap. I did the heel flap in a heel stitch with three stitches of garter on either side for ease of picking up stitches for the gusset later on. All in all I think these socks are amazing. 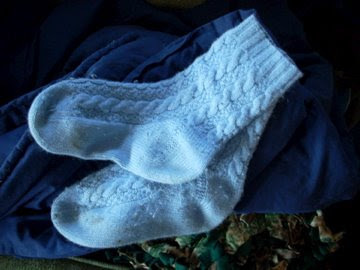 They are super soft and comfortable and seem to come with their own heat source. It's a bit strange, but they instantly warm my feet when I put them on. Wonderful! I knit most of the second one while on another tour around the Midwest. I knit in Wisconsin and Iowa and Nebraska... What a great way to spend 23 hours on a bus, I'll tell ya. Down below I have what one would call a "swatch". That's right, I made one. After seeing BrooklynTweed's version of Elizabeth Zimmermann's Saddle-Shoulder Aran Cardigan I had to make one of my own. Of course, the pattern was more a set of guidelines. 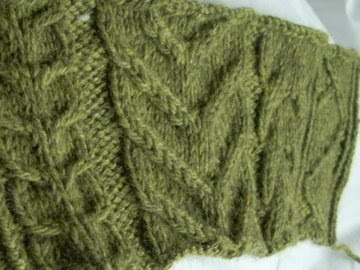 I liked the cables that Jared used on the back of his cardigan better than the ones in the pattern, but being new to all of this I couldn't figure out how they were made and so I went searching through my knitting books to find any cables that I liked that I could incorporate into the pattern. I think I did pretty well. 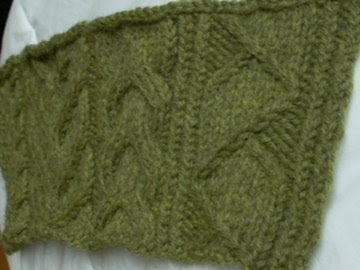 I am so glad that I knit this swatch. 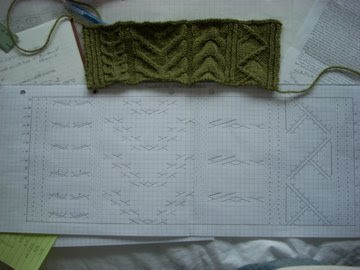 It was kind of a pain because I decided the best thing to do would be to draw out the entire chart for the swatch. 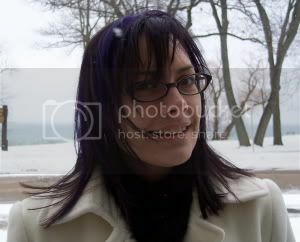 This was, of course, after figuring out my "key number" and planning out the entire layout of my sweater. 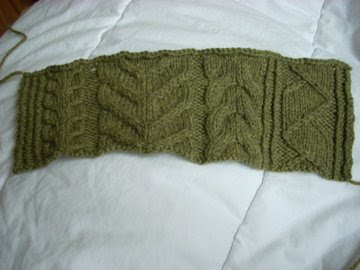 Well, I knit the swatch, washed and blocked it, and measured it. Turns out it was 4" smaller than I had predicted! No big deal. After a mini panic-attack, I did the math and figured out that I was going to have to add 46 more stitches to my sweater. I simply decided to make some of the cables larger and put more filler stitches in between them. Speaking of BrooklynTweed, I am still chugging along on that Hemlock Ring Blanket. It is taking a rest right now as one of my Knitpicks harmony tips had a bit of a malfunction and I need to wait for the replacements to arrive. I suppose it happened at a good time, as it let me spend my time planning out this wonderful cardigan that I am most likely going to be working on through the hot summer days (what poor planning). 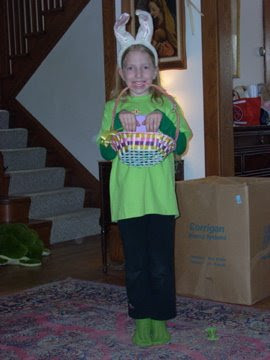 To finish it off, here are a few action shots of those hideous green things that I made for my sister. The verdict? She LOVES them! 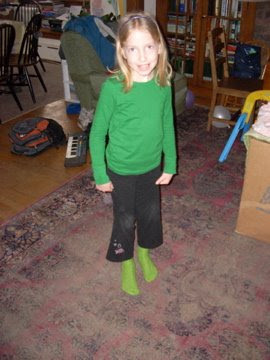 She wore them for four days straight and kept talking about how warm and comfortable they were. It almost makes me feel bad for instantly throwing away all of the extra yarn that I had, but not bad enough to take it back out of the trash. I can't wait until I make her some socks out of yarn that is actually nice. Love the Felici for socks, mine are in the Clay, and the Aurugula. My hubby would like the blue ones in exactly the size you made, with the short cuffs as he hates wearing all those long socks I made in Opal for him. Could I get a bit of feedback on them? How many stitches to cast on? you look like you have slender ankles like my hubby, and he too wears a size 12. The softness of the Felici would also work for your brothers next socks. 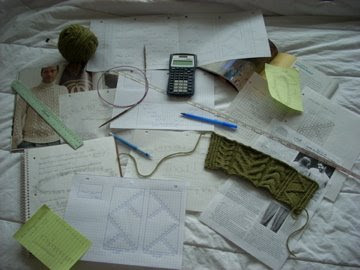 Thanks for all the info; that swatch for the sweater would have done me in; that would have been the end of my project. 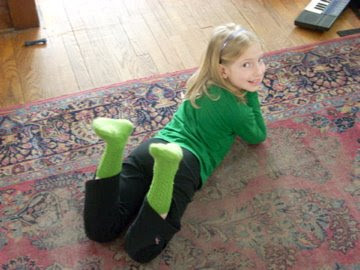 J looks cute in her socks, but that rug looks a little scary! dude, that is a lot of finished knitting! and all that work for the cabled sweater -- your SECOND sweater ever?!? (i can't cable without a cable needle yet). the blue socks look really comfy.